Over the years, stormwater management basins have been constructed throughout the Township as neighborhood development occurred. In the intervening years, little, if any maintenance on the basins has been done. As engineers, planners and environmentalists studied the impact that stormwater basins had on the environment, a body of knowledge developed. This work has lead to a better understanding of the functioning of these basins and the water courses they flow into. The Board of Commissioners believes that the residents of Aston would best be served if the stormwater basins could be enhanced to take advantage of this knowledge and directed the Township Engineer to prepare a study of each basin to determine what type of work would be required to enhance each basin. The engineer completed the report and presented it to the Board of Commissioners. The storm water basin report is available on the Aston website. The enhancements will improve the quality of the basins in order to sustain suitable control of stormwater runoff. The improvements will reduce future flooding and mitigate potential pollutants from impervious and altered land surfaces from entering water courses. Properly functioning basins will help sustain stream base flow and prevent increased frequency of streambank erosion. 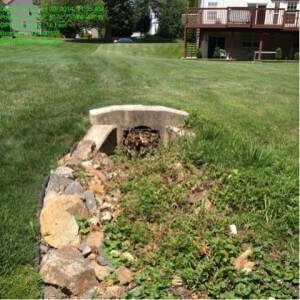 The Board of Commissioners authorized a Growing Greener grant application administered by the Pennsylvania Department of Environmental Protection (DEP) to implement all of the proposed improvements to the stormwater management basins within the Township. The grant application will be in the amount of $750,000.00. If the grant is funded by DEP, the work will be designed and implemented in 2016.